Do not start writing your summary essay unless you have really understood what you have read. Do not summarize as you read, as you will make mistakes if you read and summarize at the same time. 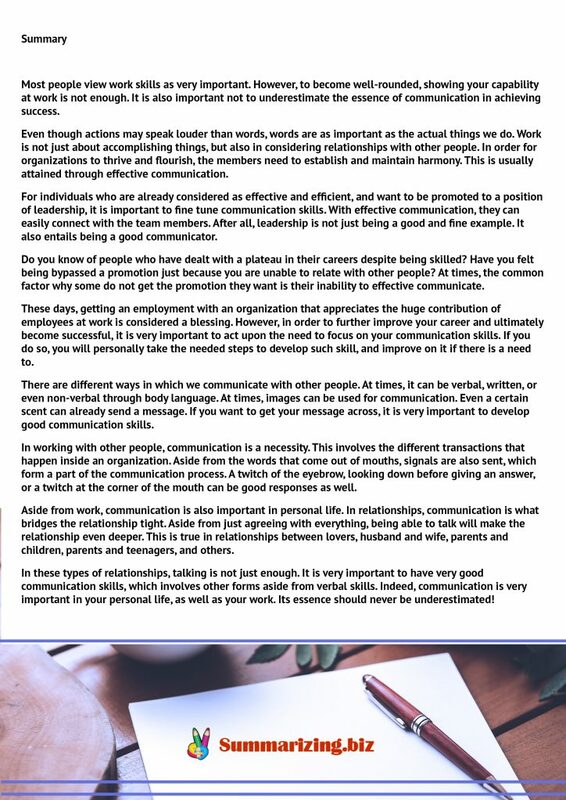 Get to understand the main points in the text. So read and create mental notes about the points and the issues in the essay. Note that your mental notes should not be a memorized copy of the text but your own interpretation of what is written. Express the ideas in your own words, as much as possible. This is the first step on how to start to summarize paragraphs of the essay. As stated, keeping the ideas of the material read is one of the features of summary essays. Thus, you might find it hard to relay these ideas if you do not understand them. For some, they see summary essays as a substitute to the source material. If this is the case, you have the transfer the idea as accurate as possible using your own words. Write down the main ideas in bullets. After reading the essay, it’s now time to write the main ideas of the article in a bullet list, sorting them by their logical order and event development. Depending on the size of the article or essay, you should create a list of 3-10 ideas. You will now use this as the basis of your summary. Avoid adding interpretations in your summary. Since your goal is to transfer accurate ideas, you may want to avoid interpretations in your work. It is natural for a reader to make his own interpretation of the material he is reading. That is why you have to guard your words. One wrong choice of word might lead to misrepresentation of the source. Adding your own examples can also alter the original idea. Your introduction should contain a thesis statement. Begin with an introduction. Typically this can be done in 3-3 sentences. Some writers find it quite difficult to introduce creatively. Basically, if you can just mention the title of the article and the author in 1-2 sentences, you should be good for a start. Write a one-sentence statement that will cover the main point of your material. It is advisable for you to rephrase the thesis statement rather than copying it from the source. Once you’re done with your thesis statement you can start introducing the text by citing its title and author. Expand each idea. Take each of the ideas on your list and expand it with the fewest words possible. The ideas should be express such that the message is passed and you do not exceed the length you aim at. Ideally, one-tenth of the original text is perfect in summary writing. Remove the minor details in the body of your summary essay. Like other summaries, omitting the minor details is one of the basics of how to write summarizing an essay. You are free to remove the little information that won’t add to the substance of your summary. Conclude. Conclude your summary with 2-3 sentences. Of course, the conclusion should also be a summary of the concluding part of the original text. If you find it hard writing a basic summary, try stating the main issue of the original piece in 1-2 sentences or use a professional autosummarizer. 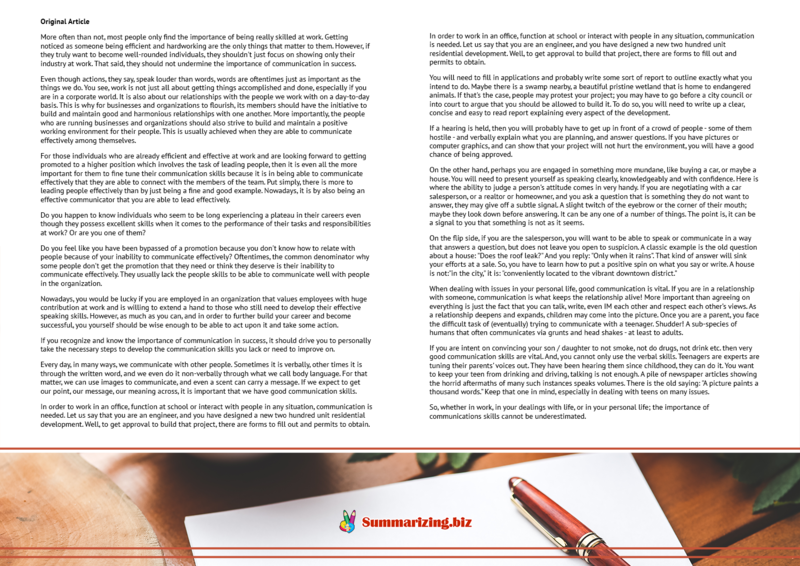 If you read, understood and followed these guidelines, you probably would now have a well-written summary written with good flow and natural structure. A friend once introduced me to someone providing summarizing services or an essay shortner as some call it. I needed a better writer who could give me a very short summary of a business plan and an idea synopsis I was supposed to present at a meeting. The lady is a professional writer with special skills in summarizing content. It did not take her much to shorten my essay and business plan and the job was superb. Summarizing services can be of great help to those who are either not skilled in summary writing or who are too busy to do the work. An essay shortener is a pro at essay writing, paraphrasing, and summary. When they get hold of your work, they read the entire document, separating the idea from the raw text. They will dissect the article, bring out the important information and make solid conclusions, much faster than people who haven’t done much of this. Since article summarizing service providers have worked on several jobs cutting across several niches, they have the ability to summarize texts in any field of study without making the test lose its meaning. While some have a good understanding of a few languages, they are also able to effectively combine translators in the summary in such a way that a native speaker of such language can tell that the translation is perfect. Summarizing services providers are experts who work with a combination of both custom and general summary software that is able to summarize both documents and web pages. They are in touch with how to use these tools more than the average user. They summarize articles and WebPages to be 20% of their original size when done, while still retaining every message that was originally in the text. Summarizing services uses their skills and tools to note words that are vital to the concept of the content being summarized and creatively retains them. Some words are of high tactical importance to a text and must be preserved. In that way, ideas behind the text are not missed. If you need help paraphrasing and or summarizing content, it’s probably just right to hire the services of these professionals. It will be worth the resources. Your academic papers, articles, books, journals, movie scripts, and business documents can be summarized by professional summarizing services so you will save your time and will get full satisfaction with the result! Don’t hesitate and get reliable summarizing assistance right away! 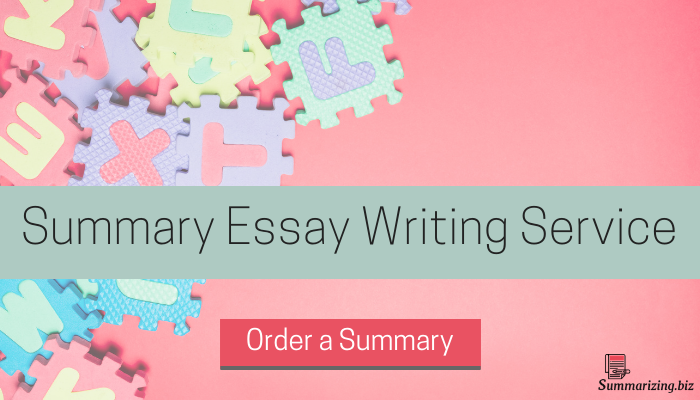 Learn how to write a summary essay through useful tips written by experts!